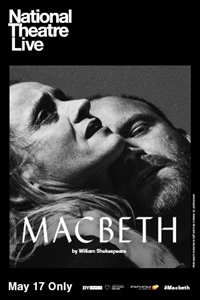 Fathom Events, BY Experience and National Theatre Live showcase Rory Kinnear's return to the National Theatre stage as the title role in "Macbeth" on the big screen for one night, Thursday, May 17, 2018 at 7:00 p.m. local time. In the ruined aftermath of a bloody civil war and ruthlessly fighting to survive, the Macbeths are propelled toward the crown by forces of elemental darkness. Shakespeare's intense and terrifying tragedy will see Rory Kinnear and Anne-Marie Duff return to the National Theatre to play Macbeth and Lady Macbeth. Directed by Rufus Norris, this production of Macbeth will be captured live one week before its cinema debut. Run Time: 3 hr. 30 mins.